Ana Carazo, oenologist, viniculturist or, as she prefers to call herself… winemaker. Here is a person who is truly devoted to wine, who truly loves her job, and whose passion is perfectly expressed through her project, La Loba. 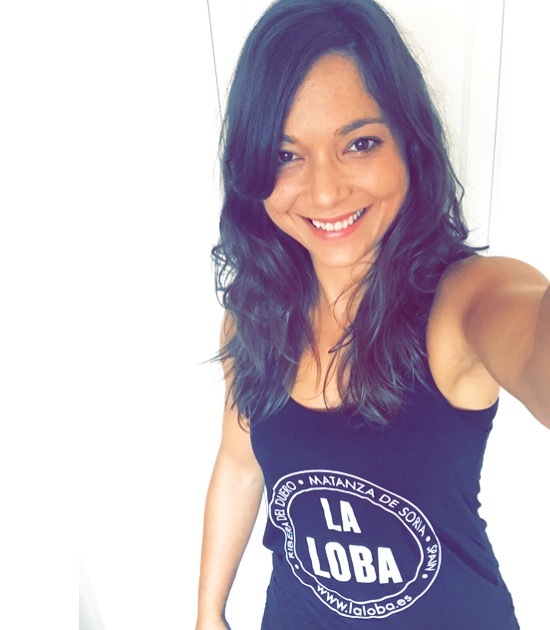 She embraces the everyday struggle to maintain the excitement, the desire, the strength, passion and feeling for what she loves, for what she was born to do, for what moves and inspires her… that, in a nutshell, is La Loba. You may find her in the vineyard with her pruning scissors, toiling away with the ever-present rucksack on her back, moving barrels around the cellars, stacking boxes of grapes at harvest time, washing out tanks, showing her knowledge and style at wine tastings, taking untold delight in fermentations while topping barrels or parading her very best smile from restaurant to restaurant explaining the essence of the family project and transporting whoever is lucky enough to sample La Loba to the vineyards of Soria from where the wine originates and where the values handed down by her grandparents are still maintained; values that speak of appreciation for hundred-year-old vines, of the humility of working with the hands, showing maximum respect for the fruit; in all, the everyday struggle to make the most of today while always looking to the future with enthusiasm, sheer, unbridled enthusiasm. She is a young, lively and dynamic person, spent many childhood hours in the vineyard of her viticulturist grand-father – himself a member of a family dedicated to wine – then subsequently trained at the School of Oenology and Viticulture, in Requena, so it’s not difficult to understand her passion and vocation for the world of wine.